The course was held in a very hilly neighborhood off of Apex-Barbecue Rd. Jeff wanted very much to run this race (yet another 5K), and Patti decided to run it as well. I ran and won this race last year. As soon as I saw Travis W., I knew I wasn’t going to win this year! He’s an amazing runner, and not only did he win, but he broke his own course record, running the very challenging course in 16.47. Greg B., 19 and from Chapel Hill, and Michael M., 32 and from Apex, placed 2nd and 3rd, respectively. It was in the low 70s and very humid. The race began promptly at 8, and as in many small races I’ve run this season, the young runners (in this race boys and girls between 8 and 12) made for a very crowded start. Fortunately, most dropped off within the first 200 meters. Surprisingly, however, two 16 year olds, wearing high school track uniforms, boxed me in at about the quarter mile mark. I said, “Please don’t box me in,” and one of them said, “Yeah, like you’re going to run this faster than us anyhow.” I did, and much faster. Be respectful of your elders, boys. The first mile was the easiest of the three, as it had a nice, long downhill stretch. I was in 4th place at this time, and only managed to keep the 3rd place finisher in my sight until about mile 2.5. During a steep uphill climb during mile 2, a thought crossed my mind: I could just stop, catch my breath, wait for Jeff, and then run with him to the finish. I almost did just that. Ha! For whatever reason, I just wasn’t feeling fit or competitive. I was rather disappointed in my performance, and only managed to take 5 seconds off of last year’s time. I was pleased with the Zoot compression shorts I wore for the very first time. It was nice to run Jeff to the finish. I caught him with about a half mile to go, at the start of a long, grinding uphill. I encouraged him, and let him know he was almost to the finish, and that there weren’t many more hills. There were, in fact, two more, as at the top of the hill, after turning right, was a 100-meter uphill climb. Then, after turning left at the top of that hill, there was one last very steep 25-meter climb. Ugh. Finally, there were two more left-hand turns to the finish. Jeff, once again, had a great finishing kick. I found Patti at the very same place. During the 100-meter climb, Patti said, “I’m feeling nauseous.” I replied, “You can throw up after you finish!” She reminded me of this after the race. I ran another 4 or so miles to cool-down. My shirt, shorts, shoes, and socks were drenched, and I was dehydrated as well. The race organizers and volunteers (most, but that’s a story for another time) did a great job. If you’re interested in running a challenging 5K, give this race a try! While there was any number of local races I could have run this weekend, I decided to travel to Greenville to run this event held to raise money for ovarian cancer research. Here’s how it all came about… My personal trainer, Michael, introduced me through Facebook to his cousin, Bethann, who is an avid runner. Bethann and I had both run the 2009 Blue Ridge Relay and the Wrightsville Beach Marathon, and our paths may have even crossed. She and I have talked about our passion for running, local running clubs, races we have run, etc., and she shared with me the story of a friend of hers who had died of ovarian cancer. Bethann and her friends decided to hold this event in her honor. This was a very well run race, from start to finish, and Bethann (who I finally got to meet face-to-face!) and the race committee should be very proud. I arrived at Greenville a little before 6. Moe’s was one of the race sponsors, and the registration and awards ceremony took place there. I signed in, and then spent some time talking with Michael, his girlfriend, Britt, and his fraternal twin, Thomas. As there was ample time to warm-up, I suggested we run the course. The three of them decided they’d walk the course instead. I had only run a little over 2 miles when I saw them, and we walked the remainder of the course together. The race started promptly at 7:30, with a wheelchair racer starting at 7:27. A couple of young men immediately took off, and most fell back very quickly. I was in the lead a quarter of a mile into the race, but I could hear a least one runner on my heels. I refused to look behind me. Besides, I knew I would have the opportunity to sneak a peek, as the course had many turns. The race was run through a very nice community, although (as usual) I didn’t notice much. I focused on breathing (once every 3rd step) and form (hips forward, arms moving). By about mile 1.5, the 2nd place runner had fallen back 10 or so seconds, and eventually finished about 25 or 30 seconds behind me. The course was very well marked, and I also had the luxury of following the lead bike, whose rider was kind enough to point out all of the turns. I also liked that the miles were not only clearly marked, but lit! (According to my Garmin, though, the 1st and 2nd mile markers were a little off.) Many of the signs indicating turns had notes below them as well, e.g., Are you thirsty? Wouldn’t you know it, the one that I noticed and that I then obsessed over said, Your almost halfway there. Yup, I felt compelled to get out a marker and change “Your” to “You’re”. I have a problem. That’s the first step, right? There was one long stretch beginning at about mile 2.25, and I could see the wheelchair racer in front of me. He was going at quite a fast clip! I eventually caught and passed him with about .25 miles left, and he jokingly stated, “No one likes a show off.” He smiled and laughed, and we both shared words of encouragement. Upon finishing, I quickly grabbed a bottle of water, fist-bumped the 2nd, 3rd, and 4th place finishers, and raced back to find Michael, as I had promised him that I would run him to the finish. I caught up with Michael when he had about a half mile to go. He looked like he was suffering a little, so I didn’t say a word; I just ran a few feet in front of him. I then let him know about the upcoming turns, and informed him that he was almost finished. With about a quarter mile to go, I asked, “Are you ready for a finishing kick?” He immediately said, “No.” Ha! I nonetheless told him that I would count down from 3, and then we’d sprint to the finish. I counted down, but Michael didn’t pick up the pace. I saw 2 women close on his heels, so I said, “A woman is about to pass you.” Not surprisingly, that is all it took to motivate Michael, and he did indeed kick it. He finished with a respectable time of 23 and change. As soon as he crossed the finish line, I headed back to find Britt and Thomas. The volunteers began noticing just how much I was running, and jokingly said things such as, “You’re going the wrong way again!” and “Here’s Superman!” I found Britt and Thomas at just about the same location that I found Michael. Britt was looking strong, Thomas, well, not so much so. (Sorry, Thomas, but it’s the truth!) This was Britt’s very first 5K, and I’m very proud of her, particularly for her very strong finishing kick. Thomas finished just a little behind her. I tried to talk Michael, Britt, and Thomas into running a couple of cool-down miles with me. There were no takers, so I ran a nice, relaxing 2 miles, encouraging runners along the way. I spoke with Bethann briefly, and then Michael, Britt, Thomas, and I walked to a local pizza restaurant and each ordered a personal pizza. I walked to the awards ceremony, which I am delighted to say started on time (another thing to be proud of, race committee), and received my award from Bethann. The emcee was quite entertaining, and upon announcing my time said, “I couldn’t bike 3 miles in 17 minutes and 45 seconds.” The award is a very nice crystal trophy. I also won a pair of New Balance shoes. Yesterday (after completing a grueling 90-minute workout and then swimming for a half hour), my good friend, Jason Page (proprietor of Bull City Running, along with his lovely wife, Kim), asked me if I would like to run this race, which I graciously and stupidly said I’d be delighted to do. I was already registered to run the Tiger Trot 5K, but I (again, stupidly) thought it would be a fun idea to see how what it would be like to run two races on the same day. I’ve certainly completed two races on two consecutive days. How hard could this be? Yeah, right. I awoke at 5:30 so I would have time to walk Xander, eat, and travel to the race start. It was already 73 degrees and the sun wasn’t even up yet. Jason had mistakenly told me the school was at the intersection of 751 and Cornwallis when it was at the intersection of 15-501 and Cornwallis. Bad, Jason, bad! I didn’t arrive at the location until 7:30. I got my bib, changed into running shoes, met Jason, ran a little warm-up with him, and we were off to the start. My quads were killing me. The race was run on a crushed cinder trail that circled the Washington Duke Inn and Golf Club. It is also a hilly course. Jason (the winner! ), a high school junior (who ran barefoot!) and I took the early lead. Jason and the young man dropped me by the half mile mark, and all that I could think about was the upcoming race – and how damn hot it was. I didn’t pay much attention to form, splits, pace, breathing, etc. I just wanted to get the race over with, recover as quickly as I could, and be on my way. Even after I had stopped running, it took me a good 15 or more minutes just to stop sweating profusely. I talked with Jason, Kim, and their daughter Elodie, drank some chocolate milk (that I had remembered to bring), ate a bagel, and headed home. Kim informed me that I won a session with a physical therapist. I need an appointment with a psychologist. I ran the mile fun run to warm-up, then joined Jeff and Patti at the starting line. The top three finishers, including me, took off, with the eventual 3rd place finisher leading the way and taking an early lead. I was passed by the eventual winner before the mile marker, and didn’t make any effort to keep up. I stayed in 3rd place until just past mile two, having seen the winner pass the 3rd place finisher at about mile 1.5. When I passed the 3rd place finisher, I felt bad for him, as he was probably no older than 16, and had just gone out too fast. He was having difficulty breathing, and his form had fallen apart. I provided words of encouragement, and actually hoped that he’d stay with me for a while. He fell off quickly. I kept this winner in my sights, but didn’t make the slightest attempt to catch him. The last mile was very challenging, as the road was exposed to the glaring sun, and I was running into a headwind. The breeze felt nice, but it certainly slowed me down. I made it to the finish, and didn’t even attempt a finishing kick. I grabbed a bottle of water, and was on my way to run in Jeff. I caught up to him when he had about a half mile to go. I could tell he was hurting. I gave him water to pour on his head, and this seemed to help somewhat. He walked a little during the last uphill portion, but nonetheless finished strong, including a nice finishing kick. I ran him all the way to the finish, made sure he was okay, and then ran to get Patti. I found her, too, with just about a half mile to go. She walked the same section of the course that Jeff had just walked, and also finished strong, yet again including a very good finishing kick. I won a $25 gift certificate to Cooley’s, a restaurant in Fuquay-Varina. 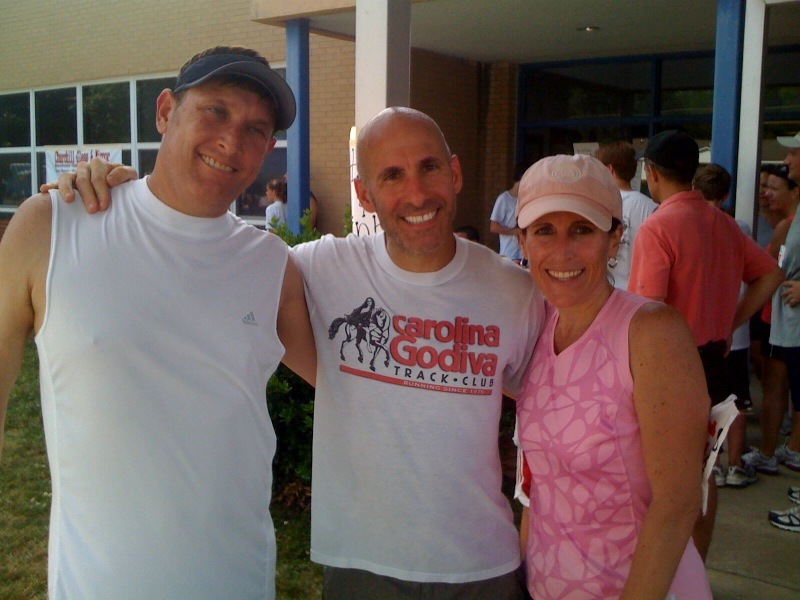 Jeff, Paul, and Patti, post-race.